1)	Anderson, W.I., Picut, C.A., King, J.M., Perdrizet, J.A. 1988. Renal dysplasia in a standardbred colt. Vet Pathol. 25: 179-180. 2)	Ronen, N., van Amstel, S.R., Nesbit, J.W., van Rensburg, I.B.J. 1993. 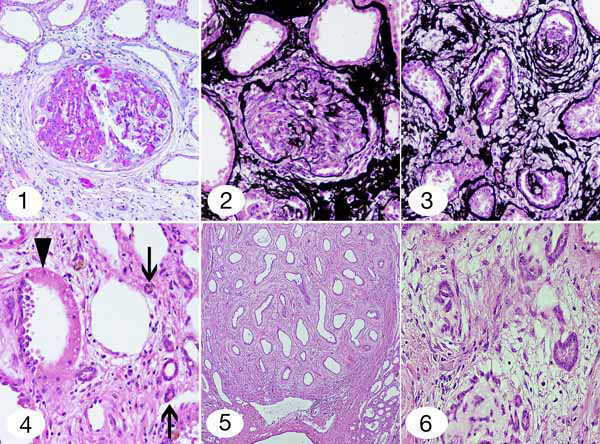 Renal dysplasia in two adult horses: clinical and pathological aspects.Vet Rec. 132:269-270. 3)	Gull, T., Schmitz, D.G., Bahr, A., Read, W.K., Walker, M. 2001. Renal hypoplasia and dysplasia in an American miniature foal. Vet Rec. 149: 199-203.